Pro-lifers have been bombarded by the secular left in an attempt to prove that God is in agreement with the slaughter of our children. Planned Parenthood went so far as to enlist a left-wing “clergy advisory board” in an attempt to convince the world that they are doing “God’s work.” Dr. Willie Parker, an abortionist who claims to be Christian also made similar claims in his book Life’s Work: A Moral Argument for Choice. Parker’s version of Christianity is that women should be allowed and even encouraged to sacrifice their unborn babies to better their own life. Yes it is true, the Bible does not mention the word abortion but then it also doesn’t mention guns or cars either, both of which can and have been used as instruments of death. There are many ways to take the life of another human being that are not mentioned in the Bible. But does that make the act of murder less of a sin? The scrolls of ancient scripture clearly defend the sanctity of life. “Behold, all souls are mine” sayeth the Lord in Ezekiel 18:4. He set mankind above all of his earthly creations. “Let us make man in our image, after our likeness and let him have dominion over the fish…over the fowl…over the cattle…and over all the earth. So God created man in His own image, in the image of God created he him; male and female…” Genesis 1:26-27. The term “with child” appears twenty-six times in the Bible. Nowhere will you read “with blob of cells or with fetus.” Exodus 21:22-23 tells us that if a man hurt a pregnant woman so that she loses the baby, he must be punished – a life for a life. Proverbs 6:16-17 tells us that God hates those who shed innocent blood. You can’t get more innocent than a baby. If murder is not a sin, why did God give us the 6th Commandment (Exodus 20:13)? “Thou Shall Not Kill.” The Hebrew word translated kill in the KJV is ratsach meaning to dash to pieces, to murder. Christ confirms this in Matthew 19:18 when he taught “Thou Shalt Do No Murder….” The Greek word for murder is phoneuo meaning to be a murderer. Even today, while the precise legal definition of murder varies by jurisdiction, common law dictates that murder is the taking of another life with malice aforethought (intent). To be guilty of First Degree murder requires willful, deliberate premeditation. Scripture repeatedly condemns the murder of children. When the nation of Israel was ready to enter the promised land God told them not to mingle with the heathen nations, not to share in their idol worship, not to sacrifice their children. In Psalms 106:35-38 we learn that Israel not only did not destroy the heathen nations as God commanded, they chose instead to “shed the innocent blood, even the blood of their sons and daughters, whom they sacrificed unto the idols of Canaan and the land was polluted with blood.” “Thou shalt not let any of thy seed pass through the fire to Molech….” (Lev. 18:21). “…Whosoever be of the children of Israel, or of the strangers…that giveth any of his seed unto Molech, he shall surely be put to death…” (Lev 20:2). 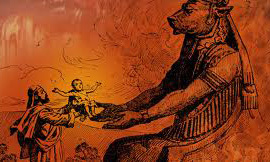 This sin of child sacrifice is mentioned as one of the major reasons why God allowed the Nation to be taken into captivity. 2Kings 17:17-18 and Jeremiah 19:5-15. It all comes back to the fact that a child in the womb is a human being. Murder is the deliberate premediated taking of an innocent life therefore, abortion is murder. ← Generation ‘Z’ the Liberal, Loose, and Last Omega Generation?